Basic ingredients: Set in a Victorian mansion in secluded grounds in Surrey, the acclaimed Tante Marie Culinary Academy is the largest independent Cordon Bleu school in the UK offering courses to novices and aspiring chefs. Courses are designed by the Gordon Ramsay Group and are listed under the categories professional (for the career minded), lifestyle (for the passionate domestic cook) or courses for gap year students. The school has five large teaching kitchens, a demonstration theatre, classrooms, library and gardens. 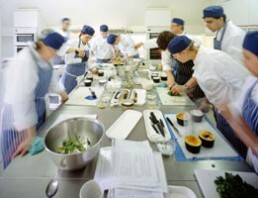 They say: We have been training chefs for over 50 years, and students from all over the world come to take our courses. We say: The comments box below speaks for itself. This is a sound option whether you’re considering cooking as a career move or a handy life skill. Look out for guest chef days with the likes of Adam Byatt and Tristan Welch and the Men Only! course comes recommended. This school gave me the stage that I’m able to perform on today at such a high level. From 0-10 it always scores 11 with me. I did the diploma course at Tante Marie and it literally changed my life. The staff are incredible, the atmosphere is electric and in the 14 years since I graduated, I have always considered the skills I learned there to be the single most important foundation of my career! No other cookery school comes close in my view! Invaluable training in such a nice surrounding and with such great personalities. I wouldn’t be where I am today without it. A solid foundation for any chef. A fanatstic ambience in which to learn top cookery skills with great teachers . I absolutely loved the certificate course I did at Tante Marie and would highly recommend it. I am a retired BA stewardess and have booked a one month course next Sept! I cannot wait as I have always wanted to be more confident in the kitchen, now here is my opportunity. Fantastic course, fantastic staff. I learned that in the field of cooking there is always something new to learn – I graduated from the yearly Cordon Bleu Diploma course and it is a wonderful base for a career in cooking and it has given me a lot of opportunities. I am half way through my diploma course at Tante Marie and words cannot describe the fun and the experiences I have had. The teachers offer a fantastic learning enviroment encouraging the best out of each student. The amazing people I have met have only added to my experience of Tante Marie, from different ages and backgrounds people have travelled wide and far to share the same experience. If you have the chance to go, GO! I was already a passionate cook before attending Tante Marie for six months back in 2010, and went with the goal of learning the basics which I had skipped over as I taught myself to cook. What I got was just that and a whole bunch more, both in an educational and personal sense in regards to making some true life long friends. At present I am writing this from a very large motor yacht outside of Portofino, Italy where I am head chef and provide one of the wealthiest gentlemen and his family with all that they want from the galley. Would I have gotten here without what I learnt at Tante Marie? Maybe, but with them and the training I was given, I certainly made it a whole lot quicker, but more crucially than that, with a whole lot more confidence in myself and my ability. I attended the Cordon Bleu Diploma course in 09/10 and have to say the skill set I left with has proven to be invaluable. Whether it was working in a high pressure commercial kitchen, for my private catering venture or just for personal cooking for the family I keep finding myself thinking back to my training and the skill set it has provided me. I took six months away from Medical Practice to do the Intensive Cordon Bleu Dilpoma at Tante Marie. A wonderful experience and one of the best decisions of my life. Not only did I learn to cook with a like minded group of mature students but I also learned to appreciate the world of culinary arts. Good cooking, fine dining, eating out, interesting recipes, good chefs and yes, the friendships and conversation which brings together foodies from around the world. The Tante Marie experience is unique. If you love food and want to learn to cook, just do it now ! I attended the Intensive Diploma course in 2009 having taken a year out from The City. I was a mature student and was very impressed with the professional approach of the Academy and the skills it and the teaching staff taught me. It was hard work but also a great deal of fun and I am still in touch with Academy today. I cannot recommend it highly enough. I’ve just finished my first term at Tante Marie. It’s a brilliant school set in a location to match. Facilities have been great and the standard of teaching has certainly not disappointed. Would recommend it to any one who can afford the fees! Hi, I did an Intensive Cordon Bleu Diploma Course and really had a fantastic time. The staff was great and very supportive. The groups were small and very international. We learned everything from scratch and developed to really advanced cooking skills. Next to the cooking we learned a lot about ingredients, menu planning and budgeting. The school was also very supportive in finding workplacements in highly ranked restaurants. Altogether a great base for a career in the hospitality business! Without Tante Marie’s hard working, passionate and motivational teachers I wouldn’t be where I am today. A wonderful place with a wonderful atmosphere, there is no other top culinary school like it. I did the 4 week Essential Skills course July 2011 and it was amazing fun. The staff are as informative as they are entertaining and the whole set up feels well-run, professional and energetic. I can’t fault the course or the school and would return in a heartbeat. Tante Marie has been a huge part of my career change and I couldn’t imagine how another school could have done a better job at setting my foundation for the future. The school is so welcoming, the curriculum really sets you up for a great future and the staff are all simply incredible! Whether it’s a full on diploma course, a day course or a charity day where you go and see new things, tips and techniques the school has something to offer everyone and I’d urge people to go and learn from the Best! The school is OK but it’s not worth the money; the teachers are too young to teach and what you learn is unusable in real, busy kitchens where skill and speed are expected and many times cutting corners. So after few years you’ll forget it all anyway and just be £13k lighter so all in all it was a bit waste for me. I am very sorry to hear that you were dissatisfied. I am inclined to diasgree regarding the age of our teaching staff who vary from 23 to 64 years of age. One of the reasons Tante Marie has survived as a business since we were founded in 1954 is that we teach a level of discipline whereby we never condone cutting corners. To do so in a kitchen will always have a negative effect on the end product, and this is not the standard we aspire to. I am confident that the extensive list of alumni who have graduated over the years and are now running their own successful businesses would agree with this, as can be seen in the wonderful comments we have received on this page! It is of course down to the individual student to decide whether or not they choose to remember or forget what we teach (and indeed whether or not they choose to apply the lessons learned once they graduate.) I would like to think that nothing is forgotten, but that where appropriate, our graduates can draw on their knowledge and decide where and how to apply it, or adapt it as necessary! I did the four week Essential Skills course. The patience and dedication of the teachers was amazing. We were all of mixed ability and age, from a chef to a school leaver and yet they managed to impart their knowledge and some excellent skills into our jam packed days. We all left having mastered various pastries, meringues, chocolate work, breads, sauces and some delicious meat and fish dishes. A wonderful start or restart to confident cooking. I would highly recommend the course. I was fortunate enough to have attended Tante Marie as a student and then returned as a member of staff. The skills I acquired there will stay with me forever and gave me the foundation I needed to build a career in catering and hospitality recruitment. The staff are welcoming and encouraging every step of the way and you really do feel part of a community. The course structure and small class sizes are conducive to a relaxed and productive learning environment. I would strongly recommend the course and the school to anyone. I have had a great experience at the Tante Marie School of Cookery. I’ve learnt many new skills and techniques and wonderful recipes. My experience was fun and the faculty is friendly and very knowledgeable. I would recommend any one interested to pursue a career in cookery and be a chef to join the school. I did the six month intensive course six years ago and loved it. It provided me with the skills and confidence to pursue a successful career as a chef. The whole experience was filled with fun which made learning there a very happy and fulfilling time. I started my diploma course this April, already I have taken so much on board and I still have another exciting term to come!!! I would recommend TM to anybody who has a passion for cooking. It’s fantastic! Tante Marie has given me a great foundation to start a great career. Can’t say enough great things about the time I spent there. Would recommend it to anyone. I attended Tante Marie as part of the Intensive Cordon Bleu Diploma Course and it has created an amazing platform from which I have sprung into the catering world. I am in no doubt that I would not be as professional and as skilled as I am should I have taken an alternative route into hospitality. Tante Marie is all inclusive with highly skilled and supportive teachers, well structured training programme, and extremely well equipped classrooms. I have learned so much at my time at Tante Marie, it gave me the building blocks to classic cooking. Excellent staff who help you every step of the way. I highly recommend it to anyone wanting to push their passion further. Thank you all. I did the intensive cordon bleu diploma two years ago. I had a fantastic time and learnt a tremendous amount. A fantastic school with fantastic teachers. Tante Marie is a truly wonderful opportunity for anyone looking to pursue a career in catering or simply further an interest. The teachers are excellent offering great support to the students but more importantly they provide a fantastic environment in which to learn. Every day is fun, the people are amazing and it’s one of the best decisions I’ve ever made. The course at Tante Marie provided me with all the tools to go on to work all over the world and in many different settings. I am so happy that I decided on this school and would recommend to anyone. Amazing! Amazing! I Enjoyed my time there and left with an experience i will cherish for the rest of my life, thanks to their wonderful staff. An impressive school, well structured courses, lovely environment and a great team. Had the most rewarding of times when I completed my Intensive Cordon Bleu Diploma Course in 2005/2006. The staff were absolutely fabulous! Very scientific, knowledgeable, entertaining thereby keeping the classes on a well structured and fun schedule. I pass on many of the skills, I acquired, to my family and friends. Lovely school, lovely staff, lovely area. I did my Cordon Bleu Diploma in 2002 and have worked in the food industry ever since, first as a food stylist and now as the author of 4 books in the UK and 1 in the US. Tante Marie was a wonderful place to foster my passion for food and give me solid foundations for a thrilling career in food to date. I would recommend choosing Tante Marie if you are looking for an enthusiastic atmosphere in which to learn, great local ingredients (including a herb garden at the school) and teachers with years of experience. Tante Marie has helped me to realise my goal of a new career in the second part of my life. With their excellent tutors, course and facilities, they have given me the tools and confidence to achieve this. After spending the first half of my course with some amazing like minded people of all ages and backgrounds, I feel that if you have a passion for cooking, Tante Marie teaches you that everything is achievable. That’s great to hear Caroline. I’m starting the intensive course this January after quitting my job; it’s not easy to change my career in my forties. The fantastic reviews that I have just read are making the wait till January too long. I have been apprehensive about becoming a student after being in my comfort zone for far too long, but the above comments are making it easier. I had the most amazing experience at TM, meeting amazing people and teachers. It provided me with all the tools and my passion for cooking with children. I would recommend this school to anyone. I graduated successfully from TM a few months ago but realized afterwards most of what is taught in this course can be found for free on youtube. I regret spending my parents’ money on this and regurgitating the school’s advertising material to convince them it was worth it. I feel awful and disappointed. Hughes – Which course did you do? What were the things that you did not like? I am curious as I am considering the school. Thanks. Ask the school for a detailed syllabus. A hardcopy in writing showing which dishes you will do and which techniques you will get taught on each day. No talk, just an outlined plan of what you pay for. Most chefs do not care about diplomas unless it is from the Culinary Institute of America, not an expensive crash course. I am sorry to hear that you feel this way. You are quite correct that these days, YouTube and the internet are a great source of information however there is no substitute for learning in a real, hands-on training environment where there is a teacher to guide you along the way. No matter how advanced the internet becomes, you cannot smell or taste through the medium of a monitor! Everyone will take their own view on this. I can only say that the extensive list of positive comments on this page are representative of the views of the 20,000 diploma graduates since 1954… we would not still be in business if the course was a waste of money!